Here comes Santa Claus...right to your table, riding in our new, beautiful Red Table Top Sleigh! 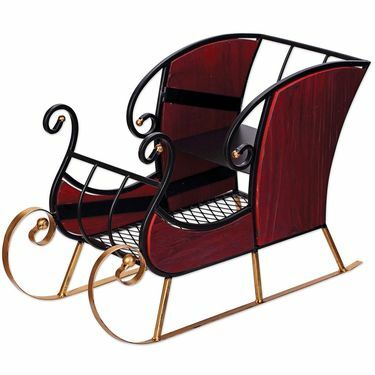 This decorative and classic Christmas Sleigh will have you singing and ringing your jingle bells all throughout your home! This elegant Red Table Sleigh has gold runners and a cargo area surrounded in elegant scroll-work throughout! Ready to please, this sleigh will add that extra touch of holiday magic we all crave. Use alone, or pair it with other holiday decorations to fill your home or office with festive cheer. Fill with a holiday stuffed animal, decorative fruit, a potted poinsettia plant, or present at a gift exchange, and more! Size: 18.5"L x 12.75"W x 8.25"H, Metal & Wood.